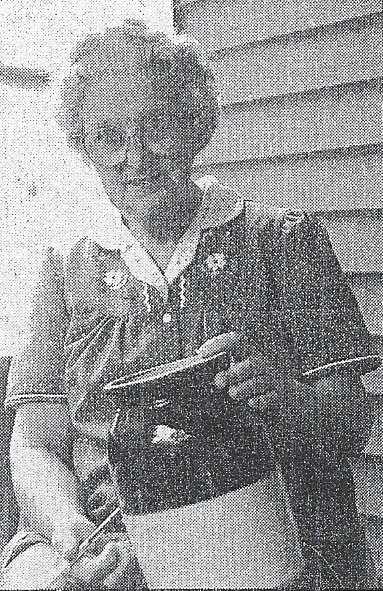 Geneva Parrish holds one of the old crockery canning jars that her mother used for canning and preserving foods. By Regina Villiers. Originally published in The Suburban Life April 5, 1995, added April 12, 2019. The column about old-time radio and Ed Dooley’s program on the history of radio brought in may responses. The best came from Geneva Parrish, who is well known around Madeira because she has worked at Adrien’s Pharmacy sine the 1950’s. Geneva remembers well all the old radio programs and the enjoyment that radio brought to the lives of people. She goes back to the days before polyester clothing and wrinkle-free cotton, so she always had lots of ironing to do. “One Man’s Family” was the story of a huge family and all of its extended members who mostly all lived in the palatial estate on San Francisco Bay of Father and Mother Barbour. Though the Barbours had their many problems, they always happily and easily solved them. They lived the good lives most of us strive after, free from stress, worry and financial pain. Geneva herself did not live the life of “One Man’s Family” in a patriarchal mansion. She grew up on a farm in Adams County between Belfast and Berryville. She was the youngest of the eight Wisecup children. Geneva remembers well all the details of that life and the fun she and her brothers and sisters had. Some of her early memories are of Dr. T.W. Roberds, their family doctor. He could be seen at all hours of the day and night, out taking care of the sick, driving the country roads in his buggy, pulled by his patient horse. Neither snow nor high water stopped him. Finally, he got a cantankerous Maxwell car for making his rounds. His Maxwell became known for exiting through the rear wall of the garage when Dr. Roberds would try to back it out the front. One of Geneva’s memories of Dr. Roberds is painful, though she laughs about it now. Her mother always pulled the children’s baby teeth, but Geneva had one that was aching and refused to come. So Geneva was sent, along with her older brother, to Dr. Roberds. He Looked at the tooth, fussing and fuming about not being a dentist, but he couldn’t pull it either. So, he went to the door and yelled out for the blacksmith across the street to come and help him. The blacksmith came over and held the little girl’s head while the doctor wrenched out the tooth. The tooth turned out to be abscessed, but it healed and caused Geneva no more trouble. Geneva attended Deadfall School, a one-room school with eight grades in one room. Her grandfather helped build the school. While it was being built, a scaffold fell, killing a man. And so it became Deadfall School. In the first grade, Geneva had only one classmate, another little girl. They used slates and chalk to write with instead of paper and pencils. She remembers getting into trouble at least once. She started laughing and giggling with her little classmate while the teacher was teaching another class. He made her come and sit under his desk at his feet. Life was not all fun for Geneva and her sisters and brothers. Lots of work had to be done. While helping her mother, Geneva learned many skills that she still uses today. And she learned to make do. She doesn’t believe in wasting anything or throwing things away. She’s always making something from something else and always has sewing and other little projects started to work on in every spare minute. She remembers that her mother made sheets and pillowcases from unbleached muslin. After a year’s use, they’d be bleached snow white. Sauerkraut-making time always required two or three people. Large heads of cabbage would be cut up with a slaw-cutter to be packed in churns with layers of salt to ‘work.” After it worked (fermented) it would be canned in smaller jars. The canning jars her mother used were heavy stone crockery jars. A lip went around the inside of the jar. A flat, tin lid fit down on their lip and was sealed by pouring melted rosin over it. Her mother bought the rosin at the drug store and melted it in a little skilled on the stove. Geneva still has some of these old jars. In the summer, they picked berries and fruits to can. In the fall, they gathered nuts and walnuts. Geneva is certain that her early training in her life on the farm is responsible for her longevity and her strength and good health. At an age when most people occupy rockers, Geneva still works at her job at the drug store. And she walks to work. She also walks to the malls in Kenwood if she decides to go shopping or to catch the bus to downtown Cincinnati. She does her own yard and house repairs. A neighbor swears she saw Geneva not too long ago up on the roof of her house. She likes to travel and takes long trips every chance she gets. Geneva figures if she ever does quit her job and decides to stay home, she’ll still have plenty to do. She loves movies and music, and she plays the organ. She collects rocks, grows flowers, plays Scrabble, and reads stacks of books. But her passion is crossword puzzles. “I’ve done thousands and thousands of them,” she said. And she writes poetry. Some of her poetry has been published in magazines. Geneva Parrish’s life would make a good soap opera for old time radio.